There’s a bit of pop-up mania lately, at least in New York. I’ve just been to two events in the past week that involved pop-ups (the Herman Miller Pop Up Shop Finale with House Industries and Bing’s For Humankind Pop-Up Expo at Openhouse Gallery full of innovative projects combining technology and design) and there seem to be plenty more on the horizon. 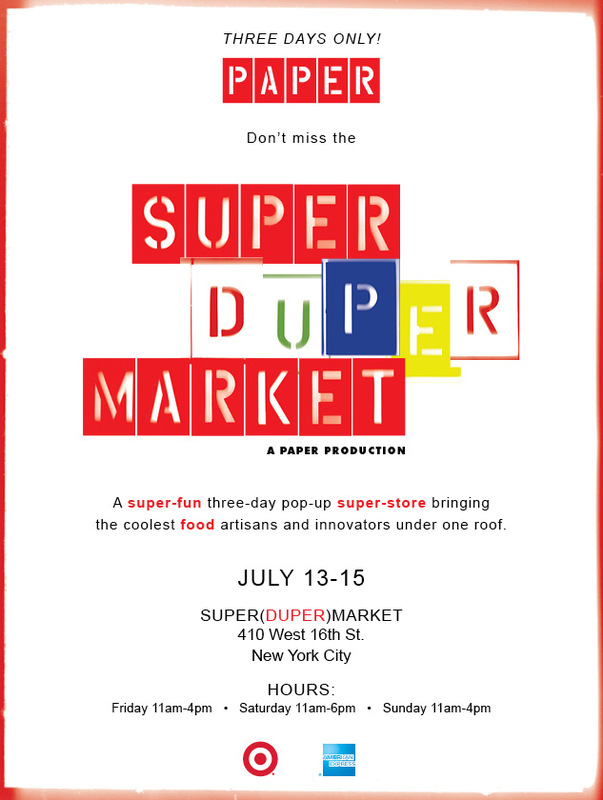 Next week, starting Friday July 13th through the weekend, Paper Magazine is presenting the Super (Duper) Market. Apparently not just a pop-up shop but a pop-up super store. This one revolves around cool food and innovation. Could be interesting. Artist Maira Kalman is participating as well! If you’re in NYC and looking for things to do, might be worth popping by. This entry was posted in Art, Event, Food, Fun, NYC. Bookmark the permalink.